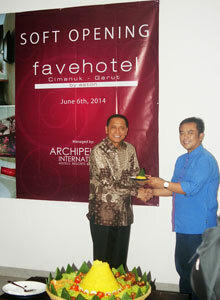 Jakarta, June 9th 2014 – favehotels, Indonesia’s fastest growing select service hotel chain, announced the opening of the highly anticipated favehotel Cimanuk Garut, marking the arrival of the first international standard chain hotel in the remote region of Garut. With endless mountain views, Garut, which is often referred to as the “Switzerland of Java” , has in recent years gained popularity as an domestic tourism destination due to pristine nature preserves, natural hot springs and stunning scenery. In the heart of Garut and just two hours east of Bandung, the favehotel Cimanuk Garut enjoys a perfect location from which to explore the city and the region beyond and aims to be the best option for business and leisure travelers seeking a contemporary, comfortable, and proficient hotel with an affordable price tag. The hotels 79 guest rooms are equipped with contemporary furnishings topped off with an interior design concept that is both modern and stylish whilst capturing the unique character of the local environment. Guests can make use of the hotel's swimming pool and the signature all-day café-shop and lounge, whilst business travelers can stay connected thanks to the hotel's 6 modern meeting rooms and complimentary high speed Wi-Fi throughout the entire hotel. “West Java is booming as the Cipularang Expressway linking Jakarta to Bandung has opened up a whole new universe of weekend getaways to the south and east of Bandung that were previously beyond the reach of all but the most determined of weekend vacationers. favehotel Cimanuk Garut will be the latest favehotel destination for savvy travelers and is fast becoming a key business hub for West Java." says Norbert Vas, Vice President Sales & Marketing Archipelago International. Soft Opening favehotel Cimanuk - Garut, seen in the picture from left to right Mr. Heru Purwono - Vice President of Finance Archipelago International and Mr. Nurcahya Arianegara Wirawangsadita - Owner of favehotel Cimanuk - Garut during the Soft Opening Ceremony. 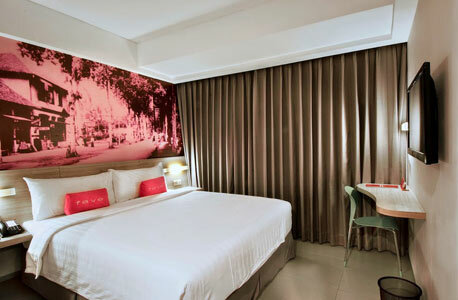 Standard Room of favehotel Cimanuk – Garut.